Jessica Lawrence lived in Hong Kong for years until she recently relocated to Seoul. Below Jessica gives us her favorite Hong Kong haunts. 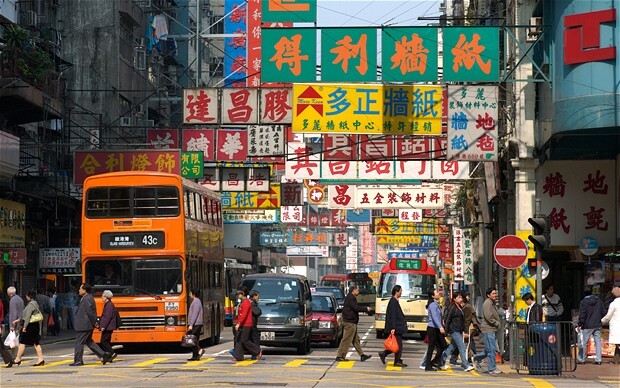 She says, "even for seasoned travelers, Hong Kong may seem overwhelming at first – the soaring skyscrapers, the crowds, the complicated smells of diesel, incense and tofu. Today, despite the economic slowdown of its mainland Chinese brother, the post-colonial city is in the midst of a political and cultural awakening. Old neighborhoods are gentrifying with hipster hangouts, world-class eateries and cutting-edge galleries. Meanwhile, conversations over yum cha revolve around the property bubble, the stock market and Hong Kong’s democratic movement. There has never been a more exciting time to visit." If your wallet permits, book a Deluxe Suite at the Mandarin and chill out in the giant soaking tub which overlooks the harbor. Stay: In Hong Kong, where one year packs the turbocharge of 10, the 1960s-era glam Mandarin Oriental is regarded as somewhat of an institution. Overlooking Victoria Harbor and literally smack bang in the middle of everything, the Mandarin (affectionately called the "old Mandarin" by locals to distinguish from its smaller and more boutiquey younger sister The Landmark Mandarin Oriental next door) has always been embraced as much by overseas guests as the city’s residents. Explore: From Central, take the Mid-Levels Escalator up to Hollywood Road. Previously known for it’s Chinese antique stores and art galleries, this area has seen a recent rebirth of cool. Here nestled between the old tea shops and pharmacies, is PMQ. The former Police Married Quarters is now home to a hive of art and design studios, modish boutiques, cafes and eateries. Check out Kapok for eclectic homewares and hip accessories, Aberdeen Street Social for modern British fare, Gong Fu Teahouse for a cup of cha, and Sohofama for organic Cantonese comfort food. Next visit the Liang Yi Museum, a private museum showcasing Hong Kong tycoon Peter Fung’s personal collection of over 300 Chinese and European antiquities. Perhaps somewhat unusually, for a museum, Fung’s collection, which includes rare Ming and Qing dynasty furniture, are free to handle, touch and sit on. End your walk by popping into the incense-filled Man Mo Temple down the street and have your palm read by a fortuneteller. Shop: Lane Crawford is the most militantly on-trend luxury department store in the city. "Better than Barneys" is how one fashionista described it. There is a Lane Crawford in almost every major shopping center, but locals tend to favor the one in IFC mall. For one-of-a-kind vintage finds and European antiques, visit Casa Capriz in Wong Chuk Hang or pop into niin on Hollywood Road for beautiful handmade jewelry and clutches. Eat: For Cantonese fine dining with a twist, head to Mott 32. Tucked in the basement of the Standard Chartered building, this Michelin-starred restaurant is reminiscent of an opulent East-meets-West opium den with its mirrored spiral staircases, silk embroidered walls, industrial-style lighting and Chinese apothecary bar. The menu here is extensive, encompassing everything from barbecued meats, dim sum, soup, seafood and delicious clay pot dishes. Try the pork siu mai with soft quail egg and black truffle and be sure to pre-order the Peking duck. Local Eats: Looking for a fun local experience? Pull up a stool at Tung Po’s* inside the North Point wet market. This dai pai dong (cooked food stall) specializes in seafood and Chinese stir-fried dishes with a twist (try the black squid ink pasta and the steamed chili clams). Wash everything down with a cold beer, served here in Chinese soup bowls. Tung Po’s owner, Rob, likes to blast the latest pop tunes from the sound system and go from table to table toasting his patrons. If you’re lucky, you might even catch him moonwalking across the market in his laser-cut wellies. Ride: Hong Kong’s uber efficient public transportation system encompasses about every form of carriage imaginable from double-decker buses to trams, cable cars, taxis and subway (MTR). For a tranquil taste of old Hong Kong, hop on the Star Ferry connecting Hong Kong Island to Kowloon and get a glimpse of the million-dollar skyline from the other side of the pond. Hike: You’d be forgiven for thinking that Hong Kong’s attractions are only confined within the urbanity. Take a break from the mega-manic metropolis and hike the Dragon’s Back – a 6.5km-long mountain trail on Hong Kong Island’s southern-most peninsula that offers drop-dead panoramas of Shek O, Big Wave Bay, Stanley, Tai Tam and the South China Sea. Start the trail by the Tai Tam reservoir, and finish just above the fishing village of Shek O. Once you reach it, dip your toes into the cool waters at Shek O beach and reward yourself with a “magic mushroom” pizza at the psychedelic beach café, Black Sheep. Relax: Jetlagged and cranky? Skip happy hour and visit Ten Feet Tall instead. Here massage therapists expertly knead away every ache and pain. If you’re feeling indulgent, ask for the “Why Not?” – a 50-minute reflexology massage where one masseuse uses traditional Chinese pressure points to relieve your tired feet while another rubs away the tension in your head, neck and shoulders. Total bliss. Gamble: For many Hong Kongers, Wednesday is synonymous with a night at the horse races. Running from September through to July, this local passion takes place right in the center of the city at the 55,000-person capacity Happy Valley Racecourse. Reservations can be made for buffet meals and viewing from the upper boxes. After Dark: Skip the overly stuffy Sevva and by all means avoid Lan Kwai Fong (Hong Kong’s notorious bar street). Instead swing by Café Gray. Perched on the 49th floor, this sleek eatery-bar – with its dramatic double-height ceilings and panoramic views – is a great place to kick off the evening. Next, head over to 001*. Hidden behind a nondescript black door, this cozy speakeasy is wedged between a fruit stall and paper lantern store in Graham Street wet market. Finding it is half the fun. Once inside, pull up a chair (there’s a strict no standing policy, so call ahead to ensure a spot) and order their signature Earl Grey Martini. Maybe two. End the night dancing your socks off at the Swedish sauna meets Berlin rave club, Fly. If your head begins to throb before you’ve even made it back to the hotel, there’s always the option to pay Ten Feet Tall another visit – they’re open till 2a.m. (see: Relax).